7 Color LED Studio or Sewing Room Lamp. 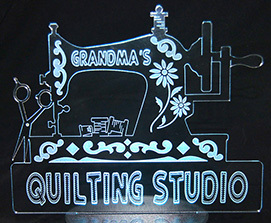 Available in: Quilting Studio, Embroidery Studio and Sewing Room for Mama, Grandma and The Queen. Also has a custom naming option. the Sewists in Your Life! Finished Size of the Acrylic Panel is 6 1/2" by 5 1/2". Be sure to select your option choice above the "Add to Cart" button near the top of the page (on the right side). Multicolored Led Lamp Base that accepts batteries or an included USB cable. Note: When choosing Custom Options Your Choices Must Be Entered In The "Notes and Special Requests" Field on the CHECKOUT page.